Fewer Canadians identify with a religion, believe in a god, or attend weekly religious services than in past decades. What explains higher and lower levels of religiosity? Is secularization a myth or reality? What impact does religiosity or secularity have on a society’s social and civil fabric? 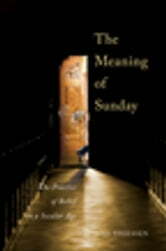 In The Meaning of Sunday, Joel Thiessen addresses these questions by weaving together narratives from interviews with members of both religious and secular communities. Exploring the meanings and motivations behind people’s religious beliefs and behaviours, the book features discussions with three groups of people: those who attend religious services weekly, those who attend services mainly for religious holidays and rites of passage, and those who do not identify with any religious group and never attend religious services. Interview responses show that religiosity levels correlate to one’s personal experiences with the supernatural, religious organizations, and social ties with those who either encourage or discourage religious identification, belief, or practice. Concluding that the demand for religion is waning regardless of what religious groups include in their programs, Thiessen suggests that, apart from some initial social and civic concern, Canadian society may be just fine without it. Testing two dominant theories in the sociology of religion - secularization and rational choice theory - The Meaning of Sunday provides in-depth qualitative research on people's "lived religion" and contributes to a major ongoing debate concerning the nature and importance of religion in contemporary society.